Tonight, Liverpool travel to face Roma, seeking to secure their place in the Champions League final. The Stadio Olimpico has been a happy hunting ground for the Reds – they won the 1984 European Cup final there against the hosts (who were in their white change kit), while in 2000-01 they overcame the giallorossi at the last-16 stage of their successful UEFA Cup run. That season, Reebok had given Liverpool a gold and navy away strip (kind of calling to mind the 1993-96 third kit) and though some domestic opponents had black socks, no change had been called for. The rules were tighter for European competitions though and, as Roma had navy socks, Liverpool had to come up with an alternative. One would imagine that the relative short notice contributed to the socks being a yellower shade than the shirts. It was the socks’ only outing, Michael Owen scoring twice in a 2-0 win which meant that Liverpool could afford a 1-0 defeat an Anfield in the second leg. Incidentally, in the semi-finals of the UEFA Cup, Liverpool faced Barcelona, whose navy shorts and socks would have meant Liverpool finding different shorts to go with the gold shirts had they been worn – instead, they gave a preview of the following season’s white away kit. However, toward the end of the season, for the trip to Bradford, with whom the home and away clashed, Liverpool recalled the 1999-2000 green away kit, meaning they wore four distinct kits over the season. Roma’s home socks in 2001 were actually black rather than navy, they went through a period of wearing red-white-black from 1998 to 2012 (interestingly, in that time period they had two spells each of wearing Diadora and Kappa kits). 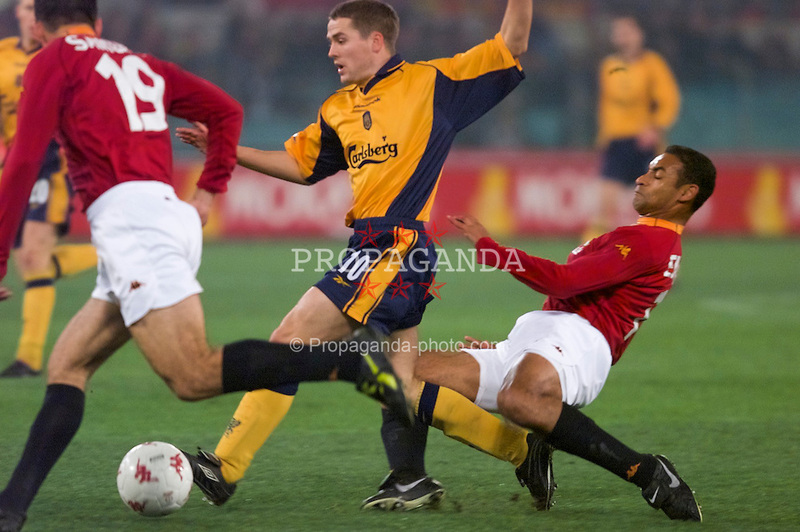 I remember seeing the slightly mismatched socks Liverpool wore that night and at first glance I thought they’d used the socks from the yellow away kit they wore a few years previous. But the socks from that kit actually had red tops, so yes it looks like someone at Reebok got the colour shade a bit wrong.